Mazda has built a strong reputation for reliability and success, especially with its flagship Mazda6 sedan. A breakout in the sometimes boring midsize car segment, the Mazda6 sedan offers dynamic styles, an upscale interior and a fun-to-drive riding experience. While this year's changes are minimal, mainly coming in the form of an upgraded interior and mild exterior adjustments, the Mazda6 dazzles buyers with contemporary accents and features that are unfounded elsewhere. Starting with the base Sport model, buyers of the 2016 Mazda6 in Springfield will be impressed with the abundant features that come standard. From the Bluetooth hands-free phone and audio connectivity, push-button starting, 60/40 rear folding seats and steering-wheel-mounted controls that are standard in every model to the 7-inch color touch display, multi-function Commander Control and rearview camera that can be found in the automatic transmission models, the Mazda6 Sport provides an exceptional array of interior features for entry-level buyers. Add in the LED taillights, intermittent windshield wipers, LED taillights and 17-inch wheels and it is easy to see why the base Mazda6 has garnered so many accolades. Upgrading quite a bit, the Touring trim is an ideal choice for buyers who desire upscale amenity at an affordable value. In fact, our 2016 Mazda6 review feels the Touring is a phenomenal choice for Springfield buyers thanks to the additional features like leatherette-trimmed seats, dual-zone climate controls, 19-inch aluminum alloy wheels and advanced keyless entry. Plus, the Touring comes available with advanced features like heated exterior mirrors, LED headlights, a power sliding-glass moonroof and heated front seats. Of course, the Grand Touring proves to be the darling of this year's lineup with leather seats, a rear spoiler, an adaptive front-lighting system, a premium active safety suite and the Mazda navigation system. A trim that delivers exceptional luxury amenities according to 2016 Mazda6 reviews, the Grand Touring is found at an alluring price when pitted against luxury midsize sedans. Despite any differences, all three trims share the basic skeleton that is made up of a lightweight chassis and a capable powertrain. A product of SKYACTIV® TECHNOLOGY innovation, the Mazda6 showcases a 2.5L four-cylinder under the hood that is rated at 184 hp along with a 6-speed manual or a dual-clutch automatic transmission that delivers premier fuel efficiency ratings. 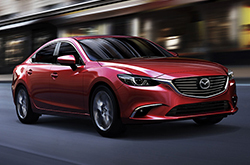 Test drive a 2016 Mazda6 in Springfield today for a firsthand experience of Mazda's acclaimed flagship sedan! We're more than confident that the Mazda6 is the right fit for you. 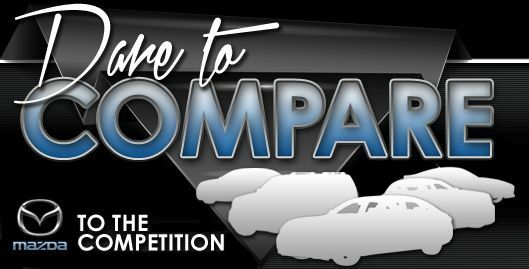 That's why we double dog dare you to compare Mazda's newest model next to the 2016 Ford Fusion, Honda Accord, Toyota Camry and the Nissan Altima. You'll benefit from the Mazda6's long list of appealing attributes, including its cut-rate cost and modern cabin features. It's a truly outstanding value. Just compare its price to the vehicle options listed above and you'll definitely see why so many Springfield drivers love it. Find out more - View the bullets below this text! 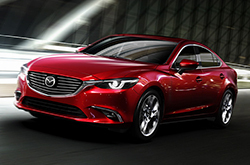 Reliable Mazda is your source for 2016 Mazda6 reviews and car comparisons. We are a leading Mazda retailer in Springfield, and it's our obligation to furnish you with reviews created by some of the most skillful automotive writers in the industry. To make good decisions when it comes to your next Mazda purchase, don't guess! Each overview is stuffed with facts, including info about vehicle features, in an easy-to-understand format. Want to read other Mazda car comparisons and reviews? Then visit our digital research gallery, where you'll learn about other new vehicles from Reliable Mazda.